January 13, 1910: The first public radio broadcast takes place. Lee de Forest was born in Iowa in 1873 and called himself the Father of Radio. He earned his PhD in 1899 with a dissertation on radio waves. He joined the faculty at Armour Institute of Technology and conducted his first long-distance broadcasts from there. In 1901, he and Guglielmo Marconi were both at the New York International Yacht Races attempting to broadcast news of the races. They were on separate boats and each used a different method for airing the news. Unfortunately, they jammed each other’s transmissions and no news was broadcast at all. De Forest, in a fit, threw his transmitter overboard. Jamming signals was a common problem with early radio broadcasting. In 1906, de Forest invented Audion, an electronic amplifying vacuum tube. It was the first triode – a partially evacuated glass tube with three electrodes; a heated filament, a grid, and a plate. He then developed an improved wireless telegraph receiver. He received a patent in 1906 for a diode vacuum tube detector and in 1908 he got another patent for a triode detector which was much more sensitive. It was the fastest electronic switching element of the time. This was vital in the development of transcontinental telephone communications, radio, and radar. It was even used in early digital electronics. 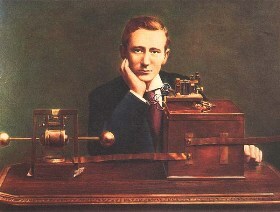 As early as 1907, de Forest advertised that it would soon be possible to listen to great music and speeches via a Radio Telephone. On this day, he set up equipment at the Metropolitan Opera House and broadcast a live performance of opera singers. Selections from Cavalleria Rusticana and Pagliacci were offered. Enrico Caruso sang for a very limited audience as there were few receivers available to pick up the transmission. The next day, the New York Times reported on the historic moment. Receivers had been set up throughout New York City in well advertised places with members of the press available. Ships in New York Harbor also had receivers. The experiment was not completely successful. Microphones of the day were unable to pick up most of the singing from the stage. Only those off-stage and singing directly into a mike could be heard clearly. There was much static and interference as well. Even with this ignominious start, more refinements were made and radio became ubiquitous with music and talk shows abounding. Today, radio is said to be dying, but even so there were 15,433 licensed full power radio stations in the US as of September 30, 2014. There are over 44,000 stations worldwide, according to the CIA Fact Book. Also on this day: Sitting on the Throne – In 1863, Thomas Crapper pioneered his pedestal toilet. Only One – In 1842, the lone survivor arrived at the Jalalabad garrison. Greece – In1822, the First National Assembly of Epidaurus adopts a new Greek flag. Prison Blues – In 1968, Johnny Cash performed at Folsom Prison. Black Friday in Australia – In 1939, a bushfire started in Victoria, Australia. September 15, 1947: The 12AX7 is released. Also called ECC83, it was a miniature dual triode vacuum tube with a high voltage gain. In the foregoing definition, the “triode” part means there were three active electrodes and the “vacuum tube” part is a tube or device that controls or regulates the flow of an electric current through a vacuum. RCA developed the tube in Harrison, New Jersey in 1947 under the development number A-4522. The device was to be a replacement for the a family of dual-triode amplifier tubes then used in audio applications. The small tube measured 2.2 inches in height and only 0.8 inches in diameter. It is still in use today in low level audio amplification applications. RCA Corporation was founded as Radio Corporation of America in 1919. In 1914, Europe erupted into war and soon the entire world seemed to be involved. During World War I, instant communication was essential and radio was useful in this regard. The Germans lost their submarine communications cable which was the only telegraph at the time. In order to communicate between allies in the Americas, long distance radio was needed. In the US, the government took charge of patents owned by major companies in order to work on radio communication development. On April 8, 1919, navy personnel met with General Electric Corporation to ask them to stop selling radio components overseas. The navy and GE created an American-owned company and created a radio monopoly. That company was Radio Corporation of America. After the war, radio towers confiscated during the fighting were returned to the original owners. GE continued to use RCA as its retail arm for selling radios and later Westinghouse also used RCA for marketing their radios. In 1929, RCA purchased Victor Talking Machine Co. and entered the phonograph market. They sold their first electronic turntable in 1930, which was also the year they broke away from GE. RCA demonstrated an all-electronic television system at the 1939 New York World’s Fair and developed the US’s first television test pattern. By 1941, RCA Laboratories worked on many different audio and visual projects. In their Princeton, New Jersey lab they created color TV, the electron microscope, optoelectronic emitting devices, LCD displays, videocassette recorders and many more interesting items. They went out of business in 1986 and the RCA trademark is currently owned by the French conglomerate Technicolor SA. The trademark is used by Sony Music Entertainment and Technicolor, which licenses the name to other companies such as Audiovox and TCL Corporation. I Feel the Need for Speed – In 1881, Ettore Bugatti is born. What is That? – In 1916, tanks were first used in battle. Railroads – In 1830, inter-city passenger rail travel began. May 2, 1932: Jack Benny’s radio show premieres. Jack Benny, whose real name was Benjamin Kubelsky, was an American vaudeville performer, comedian, radio and television star, and actor. Benjamin was born to Polish immigrant parents residing in Chicago. His father was a saloonkeeper who later became a haberdasher. Ben studied violin from the age of six and due to his local fame, he was invited to play his instrument on tour with the Marx Brothers. But, at age 17, his mother refused to allow it. A famous violinist of the age was Jan Kubelik who was frightened the horrible vaudeville entertainer would tarnish his reputation. He insisted the young man change his name. He became Ben K. Benny. After serving in the Navy during World War I, at times entertaining the troops, he returned to the stage and his violin act. He now added standup comedy sketches to his act as well, having learned in the service that when his violin playing (which was truly accomplished) was not well received, his jokes were. Ben K. Benny took to the stage, only to find someone else thought the name too similar and threatened to sue. He took the common sailor’s name, Jack, and became Jack Benny. His stage persona was based on a lousy violinist who was stingy yet completely self-satisfied. He was vain and petty on stage, and gave his audience a rich set of characters which his foils were always given the opportunity to best. As long as the show got laughs, Benny was happy. He carried on a ten-year radio feud with his real life friend, Fred Allen. His comedic timing was legendary and led to a career of well known sight and sound gags. Rochester, his chauffer, was one of the first African-Americans who was treated as an equal on stage and allowed – even encouraged – to outwit his boss. Benny’s wife also worked on stage with him, performing as a “friend” rather than as a wife or even girlfriend. Mel Blanc, the voice of Bugs Bunny, also provided Benny violin lessons and tons of sound effects. 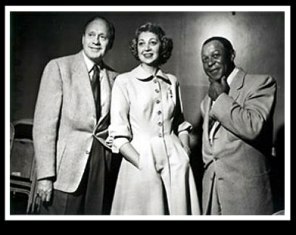 Jack Benny’s radio show ran from 1932 to 1955. Also on this day, in 1230 William de Braose was hanged after being caught in bed with his host’s wife.